Entries will open 2 April 2019. 1. The awards are open to any company, agency or individual, from the HR sector. All entries will be judged against the criteria indicated for each category. Entries must be from UK-based HR teams/individuals only. While we will recognise the supplier’s contribution in our coverage of the shortlists, it is the client who will be named as winner. 3. Entries must fulfill the definitions of the category in which they are entering (see categories for details). The challenge – An outline of what the organisation hoped to achieve. Benefits to the organisation – Highlight the benefits for the company – financial, motivational, etc. HR’s contribution to the business. 4. All work should be entered using our online entry system. Video files should not be uploaded but hosted and links provided. A high resolution version of your company logo and a supporting picture should be uploaded at the point of submission that will be used in the awards presentation if your entry is shortlisted. 6. Entries will be judged by a distinguished panel of experts drawn from the HR industry selected by Personnel Today. Decisions of the judges will be final. No correspondence will be entered into. 7. There is an entry fee of £195 + VAT per entry per category, which must be paid for at the time of submission via creditcard or by invoice. If you are not paying online, cheques should be made payable to DVV Media International Ltd. and mailed to Heather Austin-Olsen Personnel Today Awards, DVV Media International Ltd, 7th Floor, Chancery House, St Nicholas Way, Sutton, Surrey, SM1 1JB, UK. Please include your full contact details plus categories/entry ID that the payment represents. Please note, if payment has not been received by the judging day, your entry will be disqualified. 8. If an entry is deemed more appropriate for another category, Personnel Today Awards reserve the right to move this without notifying the entrant in advance. 9. The closing date for entries is midnight on 7 June 2019. 10. Entries arriving after the closing date will be disqualified. Any entries received incomplete, illegible or not complying with the rules will be disqualified subject to the discretion of the Chair of the judging panel. 11. If you have not received confirmation that your entry has been received please contact Heather Austin-Olsen on +44 (0) 20 8652 5211. No responsibility can be accepted for entries lost during the online submission, Personnel Today Awards recommend that you keep a copy of the submission as a word document and then paste the appropriate information into the text fields. 12. You will be informed via email if your entry has been shortlisted. 13. 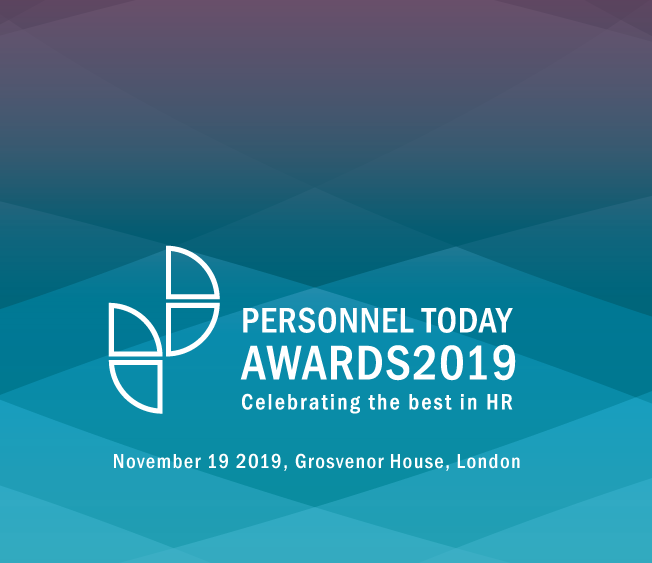 The announcement of the winners will be made at the Personnel Today Awards, taking place at the Grosvenor House Hotel on Tuesday 19 November 2019. The Personnel Today Awards is a paid for event and all attendees, including shortlisted entrants, will need to purchase tickets. All bookings will be confirmed within 4 working days. If you do not receive confirmation of your booking from Personnel Today Awards please contact Heather Austin-Olsen on +44 (0) 20 8652 5211. Bookings may be paid by credit card at the time of booking; otherwise, we will invoice you. Invoice payments must be received by DVV Media International Ltd. within 28 days of the invoice date or by close of business 5 working days before the Event, whichever is the earlier. Payment must be received in full prior to the event. Please submit dietary requirements via the online guestlist, this can be done at the time of purchase or by logging back into your account before the guestlist deadline. Dietary requirements must be received within 72 hours prior to the event, otherwise, charges will apply and it may not be possible to take care of the specific requirements of any guest. Photographs and video will be taken at this event. By taking part in this event you grant the event organisers full rights to use the images resulting from the photography/video filming, and any reproductions or adaptations of the images for visual presentation or social media or marketing purposes relating to the event or future events organised by DVV Media International Ltd. By entering the event premises, you waive all rights you may have to any claims for payment or royalties in connection with any use of these materials. Cancellations must be made in writing to the registration contact at the address below. If you cancel on or before 18 October 2019 we will refund your booking fee less an administrative charge of 15%. If you cancel after 18 October 2019 no refund will be given. If the event is canceled all paid booking fees will be refunded. We do not, however, accept liability for traveling, accommodation or any other expenses incurred as a result of any cancellation or postponement of the event.